Izzie’s released a Holo Glitter Eyeshadows Set for Catwa, LeLutka and LAQ/Omega mesh heads (including BakesOnMesh system tattoo layers) at the mainstore and on Marketplace. The set includes eyeshadows in 16 colors. Please try a free DEMO before purchasing! Izzie’s released a Fall Eyeshadows set at the “Hazy Days of Autumn” round of TLC! The set includes appliers for Catwa, LeLutka, LAQ/Omega and BakesOnMesh system tattoo layers. The eyeshadows come with and without eyeliner. Please try a free demo before purchasing – there are demos at Izzie’s mainstore as well! 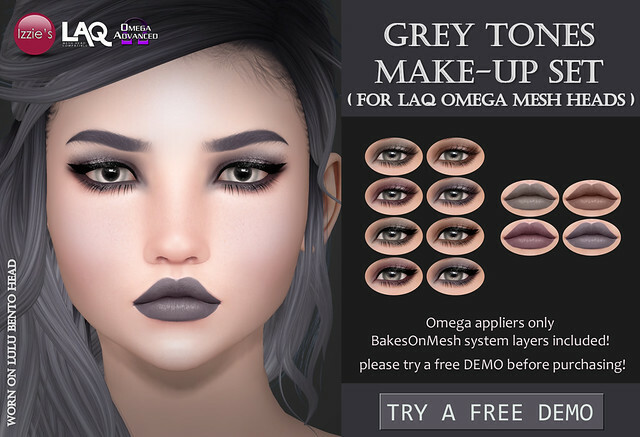 Izzie’s released Grey Tones Make-Up appliers for Catwa, LeLutka and LAQ/Omega mesh heads at Izzie’s mainstore for Fifty Linden Frightdays. The sets include eyeshadows, eyeshadows + liner and lipsticks in 4 colors. BakesOnMesh system tattoo layers are included. To make sure they will work for you please try a free DEMO before purchasing! Izzie’s released a Spring Eyeshadows set for Lookbook! Lookbook is a free shopping Hud, that allows you to purchase items from some of your favorite cosmetics creators from the comforts of your own home. Demo the items and purchase them when you’re ready with a few simple clicks from the HUD. You can get your free Hud on the 27th of each month either through the Lookbook Inworld Group or on Marketplace. Izzie’s Spring Eyeshadows set includes appliers for Catwa, LeLutka and LAQ/Omega as well as system tattoo layers for classic avatars and BakesOnMesh system layers. They come in 12 colors with and without eyeliner. Please try a free demo via the Hud to make sure they work for your head/skin! By clicking the vendor pic on the Lookbook Hud, you can purchase the full set. A gifting option is available too. After this Lookbook round the eyeshadows will be available at Izzie’s mainstore and Marketplace as well.